The bird sits perched on a branch at shore-side waiting patiently for the right moment. All of a sudden it dives rapidly head first into the lake coming up with a fish for its dinner. This bird is the Belted Kingfisher, a common summer visitor to Long Lake. 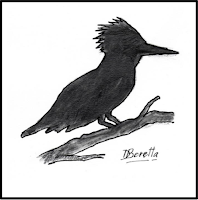 The Belted Kingfisher is commonly found in summer throughout the U.S. wherever there are suitable bodies of water for its habitat. Like many other birds (and people) on Long Lake, these are ‘snowbirds’, moving down south for the winter. I have seen them many times in Florida and the Caribbean, especially in lagoons. 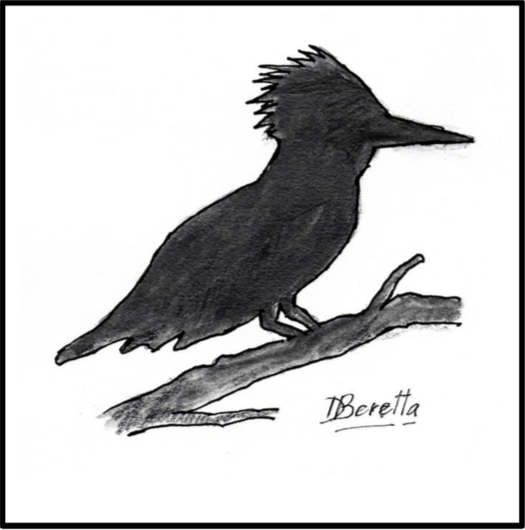 A mid sized bird with a large head and a distinctive mohawk crest, the Belted Kingfisher is easy to identify. Sometimes you can only see the profile but this is sufficient to tell it is a kingfisher. In good light, you can see the slate blue coloration of its back and breast band. In many of species of birds, males are brighter than females (think Cardinals, Hummingbirds, Orioles). In an an apparent reversal, the female Belted Kingfisher is showier than the male, as she sports a rust color band on the belly. Often when I’m kayaking at Long Lake, I hear the kingfisher's territorial call, a repetitive chattering. I don’t really understand bird guide books description of bird calls, but the kingfisher has such a distinctive call that you can quickly learn to recognize it. Keep an eye and ear out for the Kingfisher on Long Lake this summer. 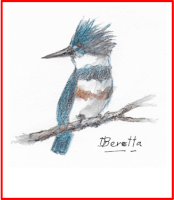 These 2 drawings of Kingfishers by Dante Baretta's can be seen in a larger size by clicking on them. ★ Note: Our Long Lake Area Association annual meeting is coming up on Saturday, June 30, 2018 at the Hubbard Community Center. Social time, refreshments & registration start at 9:30 AM with the business meeting starting at 10 AM. This year's speaker is Jason Durham, a well-known guide and sport fishing educator.